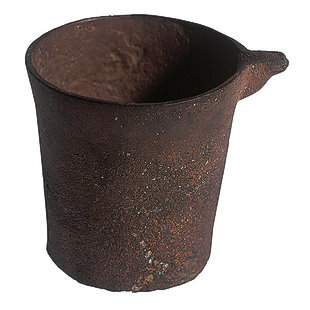 This bronze vessel was used as a measure. The handle is missing. It is decorated with geometrical shapes in the form of zigzag lines. The vessel was used for keeping liquids. Measures were of various kinds and capacities. Each measure is calibrated for certain amounts of liquid: one liter, half a liter, etc. Usually the smaller measure was inserted into the larger vessel until it was filled to a certain limit. Alternatively, liquid was poured into it to the required level. The measure was perhaps designated for chemicals or perfumes. Many measures of different capacities were found in Egypt in Ptolemaic and Roman times. Some of them are of ancient Egyptian origin; others were introduced by the Greeks and the Romans. These measures continued in use throughout the Byzantine and Arab eras.